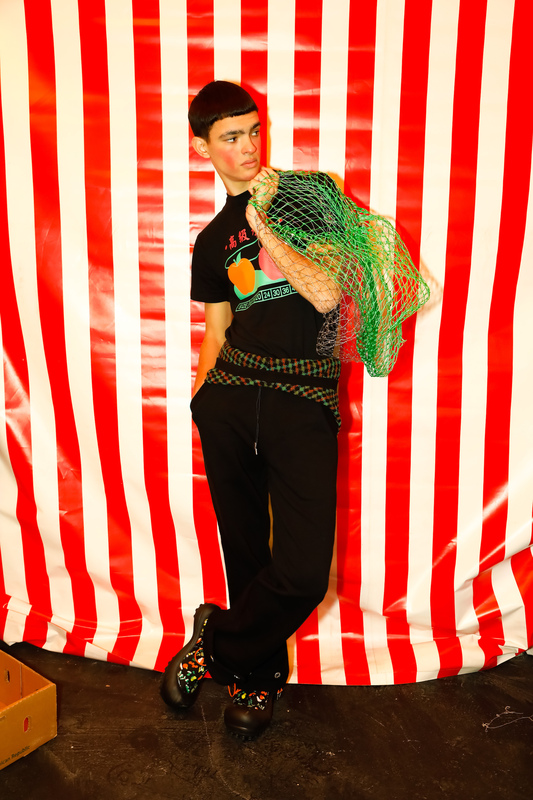 Meet the designer bringing fun back to men’s fashion with soda can necklaces, nectarine sweater-vests and wicker bonnets. 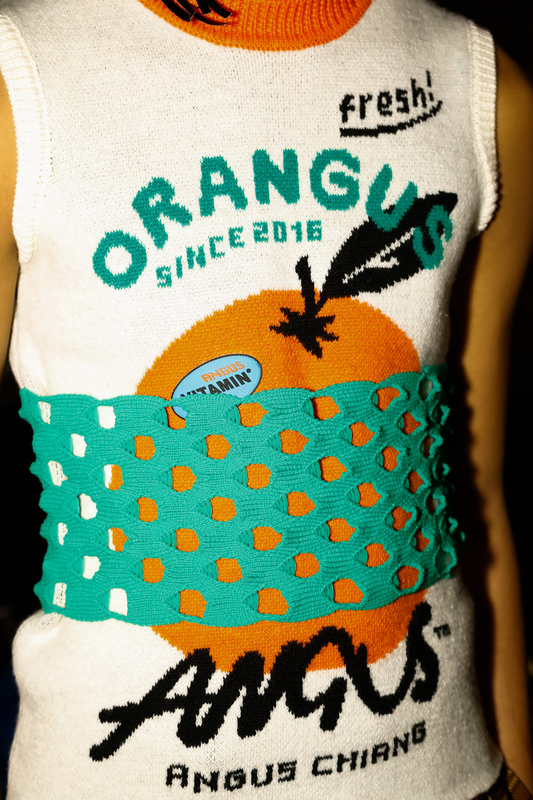 A knitted sweater vest features an orange, waist-wrapped in kitsch green netting – just like the ones you’d pick up from an organic fruit stall in summer. A closer look, and normcore bracelets are constructed with rows upon rows of linked-up soda can pull-tabs. 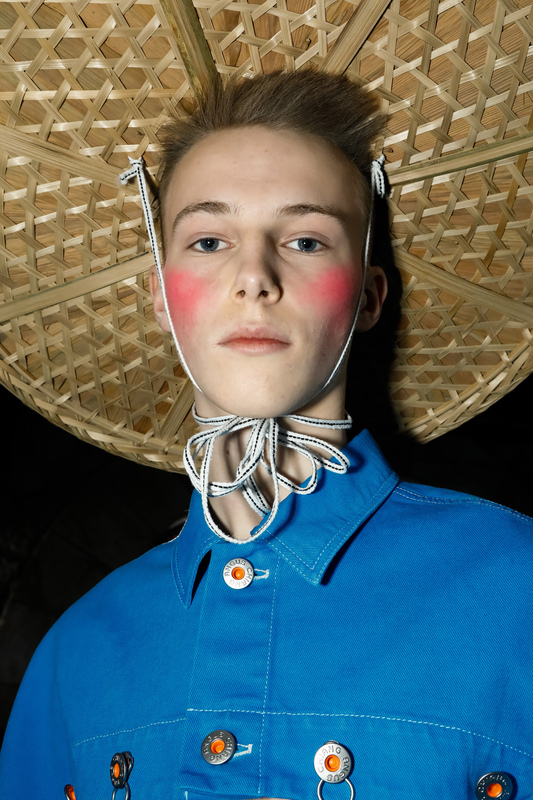 Wicker bonnets top the heads of male models with shocks of fuchsia blush emblazoned on cheeks. At a time when designers oft take themselves a little too seriously, ANGUS CHIANG is cultivating a lush, pop identity with tongue-in-cheek sensibilities. Think fun, but fun done well. 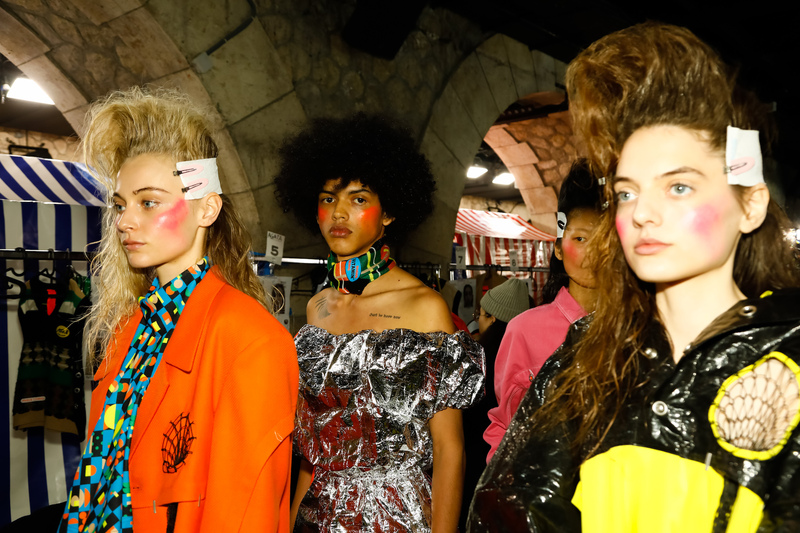 And for the brand’s AW19 offering in Paris, the collection cascaded pure, unadulterated joy over show-goers. Models swept by covered in all things fruit, with cartoon prints and fruit stickers abound. 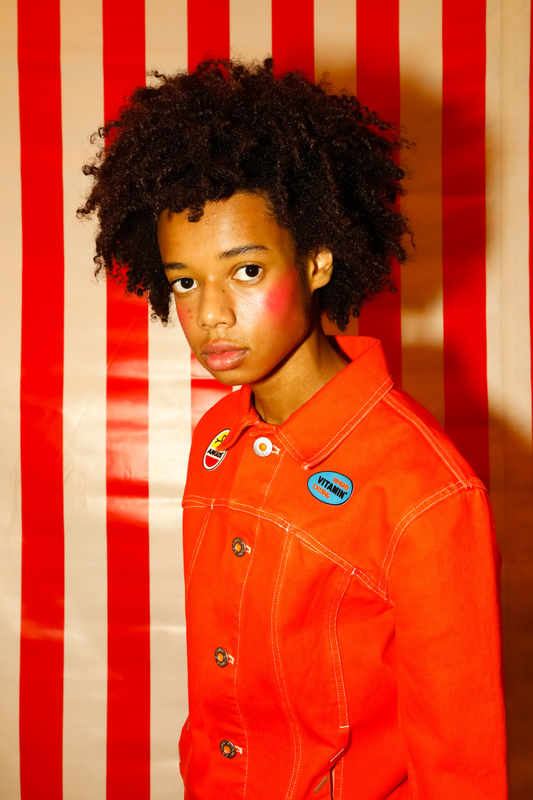 And happy primary colour separates were inflected with tassels, fluffy patchwork and unlikely features such as denim jackets deconstructed with dungaree fasteners. How did you first get involved with fashion? At first, I was interested in animation; however, I failed at the entry exam for the university. Fashion design became my major instead by accident. Later on, my collection “Sailing to the Moon”, was presented during London Graduate Fashion Week and I won my first award in fashion designing so I just keep doing it. Funny, humorous and colourful. I like to express my personal feelings through these various elements and make people feel the fun. 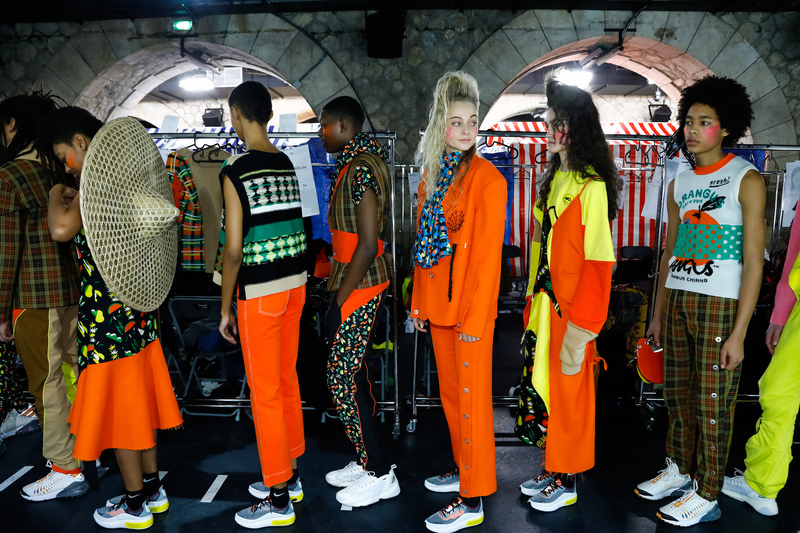 How important to you are your cultural roots when it comes to designing clothes? Actually, most of my inspiration comes from my hometown Taiwan – the memories of my childhood and at school. Also, the city landscape of Taipei. Your designs are usually quite gender-fluid, why is this important to you? I think the clothes should not be limited by the gender. A piece worn by a person already gives different meaning to the clothing. When I design clothes, I don’t think of the gender, but instead the joy that will be transmitted to the wearer. What kind of person is wearing ANGUS CHIANG? ANGUS CHIANG is a naughty person. One that likes to trick friends, to make jokes and have fun with everyone. Also, it’s someone who loves to explore and dream. What were the main inspirations behind this collection? Fishing and farming culture in Taiwan. It used to be an agricultural society back in times and still is in certain areas. The woven bag this season is a collaboration with a Taiwanese artisan/fisherwoman, and the set design of the show is a copy of a traditional fruit market. How do you think it’s different from your last collection? In this collection, we try a lot of new fabrics. Before, we focused on a mix of sportswear, workwear materials and knit, but this season we added embroidered pieces and hand-dyed colourful puffer jackets. You’re known for your bright knitwear, why is this always a focus for you? I lived in America for a while. And during this time I saw many kids wearing colourful clothes in their own way. So that’s why I always put exaggerated and impactful colours in knitwear. Also, I like how the woven technique can transform the looks from 2D to 3D in a surprising way. What’s the best piece of feedback you’ve had about the brand? I was so grateful when ANGUS CHIANG was shortlisted for the LVMH Prize Young Fashion Designer in 2017. Because of this opportunity, I came to France for the first time and it’s from there that my voice started to be heard. How do you feel about doing amazing things as a Taiwanese designer? I feel really thankful to each of my friends and co-workers. Without them, I couldn’t make the collection or the show happen. ANGUS CHIANG will continue and collab with different unknown artists from Asia. As we always got good feedback from our smaller products in the shows like helmets, tea bottles and ceramics objects, we will also keep exploring lifestyle items.